Calgary MP Deepak Obhrai took a strong stand against his fellow Conservatives at the party's policy convention in Halifax Saturday. 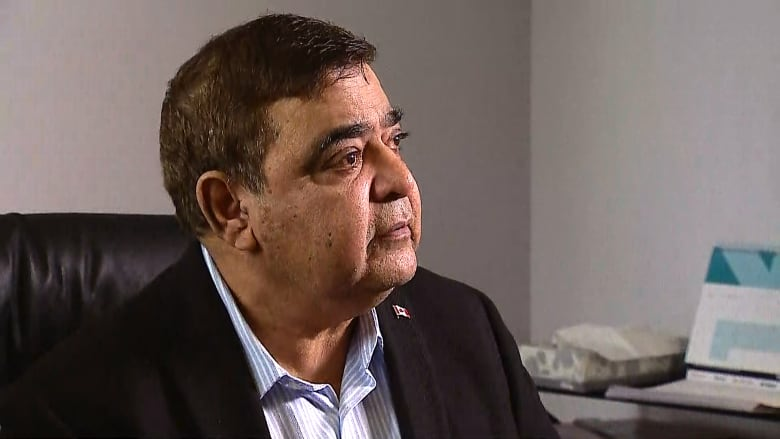 Calgary MP Deepak Obhrai took a strong stand against his fellow Conservatives at the party's policy convention in Halifax Saturday after delegates voted to end birthright citizenship for anyone who doesn't have a Canadian parent or a parent with permanent residency. The vote was a close one — going to electronic tally — but eventually passing by a near margin. Obhrai stood up to speak against the policy change, earning cheers from many in the crowd. "The government should not have a right to decide who is Canadian," Obhrai told CBC Calgary Saturday evening in a phone call from Halifax. "Because in my view, that is a very slippery slope, because you know countries everywhere else use these laws to deprive citizens from their citizenship." Obhrai said he felt it was important to take a strong stance against the non-binding resolution — which those in favour of argue would stop people from coming to Canada in order to have "passport babies." According to Statistics Canada, in 2016 there were more than 380,000 babies born in Canada — of those, only 313 children were born to mothers whose place of residence is outside Canada. It's unknown how many of those cases are ones where a non-Canadian woman travelled to Canada for the sole reason of giving birth, as the numbers include Canadians who live abroad but return to the country to give birth. "The fundamental point that I was making and that I'm very strong about is who is a Canadian is enshrined in our laws," said Obhrai, noting that the vote only passed with a "small majority, so, you know, a lot of people do not agree with that motion." Obhrai also commented on former party member Maxime Bernier's comments against diversity earlier this week. The onetime leadership candidate was absent from the convention as he dramatically exited the party this week, after a string of controversial statements on Twitter about immigration. "I disagree with that concept because diversity has been a great strength for this country," Obhrai said. "In general terms, our policy should be based on what is good and diversity has been very beneficial to our country." Some attendees at Ahmadiyya Muslim Jama'at convention in Calgary, one of the country's largest annual Muslim conferences, also condemned Bernier's comments Saturday. One of the conference's objectives, according to organizer Sultan Mahmood, is to welcome people of different backgrounds, including Indigenous leaders, and promote a message of peace and build bridges. "Generally we don't comment on political matters, but as far as diversity goes we, as Ahmadiyya Muslims, we believe diversity is an important aspect of what makes up the mosaic of Canadian society," said spokesperson Akbar Ali.